They’re caused by sun damage so they usually appear on the places you tan most; the face and hands. There is no need to remove these unless they bother you. If you intend to continue sun tanning, it probably isn’t worth while having the treatment as others will likely appear in due course. But if you do decide to have them removed, laser treatment is very effective. "It doesn’t matter who you see at this clinic as they are all brilliant. Professional but fun and no sales speels. A great team and far better than other places I have tried. You just feel safe as they know what they’re talking about." Is it an age spot? There’s a small chance something that looks like an age spot could be something else. If they are not obviously sun spots we would encourage you to get your GP to examine them first. We will not put you at risk. Your skin is precious and you need the right advice. Lasers work by producing light of a very specific wavelength. If the wavelength of the laser is matched to the target colour (such as the brown blemishes) the energy of the laser is absorbed by the blemish but not by the surrounding skin. The damaged blemishes are gradually dissolved and removed by the body’s immune system fading over several weeks after treatment. This will be better explained at your consultation so you are fully informed about what to expect before you start your treatment. 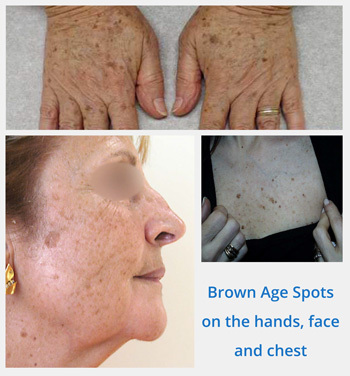 We can tell you more about the laser removal of Sun Spots, Liver Spots and Age Spots and how long it might take at your consultation.